MaxBulk Mailer is a full-featured and easy-to-use bulk email software and mail-merge tool for Macintosh and Windows that allows you to send out customized press releases, prices lists, newsletters and any kind of text or HTML documents to your customers or contacts. MaxBulk Mailer is fast, fully customizable and very easy to use. MaxBulk Mailer handles plain text, HTML and rich text documents and gives full support for attachments. With MaxBulk Mailer you will create, manage and send your own powerful, personalized marketing message to your customers and potential customers. Thanks to its advanced mail-merge and conditional functions you can send highly customized messages and get the best results of your campaigns. You also have support for international characters, a straightforward account manager with support for all type of authentication schemes including SSL, a complete and versatile list manager, support for importation from a wide range of sources including from remote mySQL and postgreSQL databases. 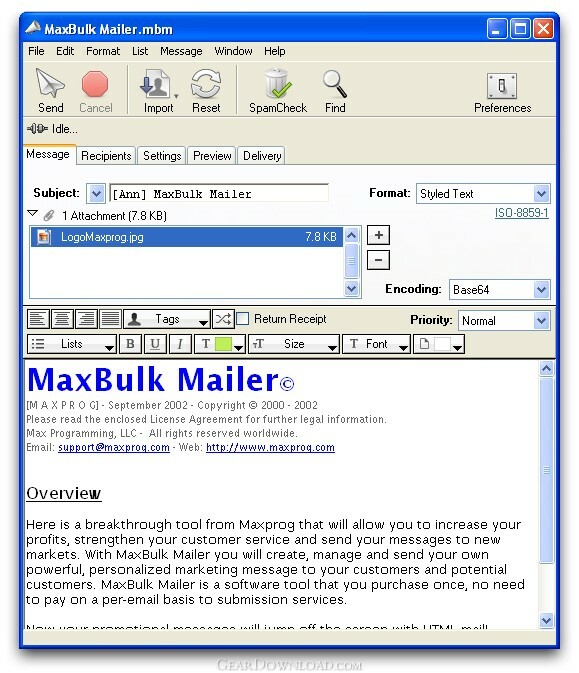 MaxBulk Mailer is a software tool that you purchase once, no need to pay on a per-email basis to submission services! What's New: The delivery report now includes the full lists of lists when 'Remote List' or 'Several Lists' options are selected. The Find Recipient window now remember the target list selection. Loading remote list no longer takes large amount of time. Loading the multiple list panel is now faster. This download (MaxBulkMailer_setup.exe) was tested thoroughly and was found 100% clean. Click "Report Spyware" link on the top if you found this software contains any form of malware, including but not limited to: spyware, viruses, trojans and backdoors. Emoticons Mail 3.2 - Quickly insert graphical smileys into your Outlook email messages. 1st Mass Mailer 6.91 - 1st Mass Mailer is a very fast mass mailer with a lot of useful features. Atomic Whois Explorer 8.05 - Extract contact data from global Whois database - email addresses, phones, etc.